k.d. lang- Tune in to Her Wave! I know, it's been like 6 months... what can I say, I've been busy and kd hasn't :) Anyway, I'm going through the links, so if you know of any new ones to send me then NOW is the time. 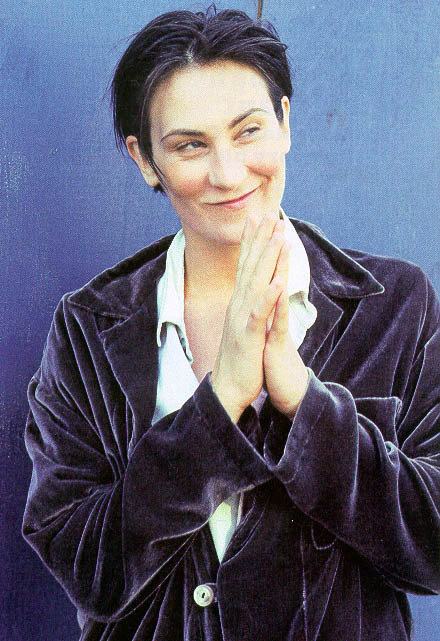 My little collection of rarer kdlang pics. Mostly stuff I didn't see elsewhere :) WARNING! *Big* pics to download! The fan site is currently mirroring the WBR site, but I'll leave this just in case. Not sure if this site is still under construction... organized like a menu, definitely a tasty treat! Last updated 10/23/95... ok, it's time for someone to catch the FAQ up! Deb's link site to online interviews and other kd pages. This basically gives kd's complete discography, in a cute little purple layout. Also those of the other Holy Sisters: ME & the IndigoGirls. This is Sassy's little picture tribute to kdlang. Has some personal pictures and a few published ones. This is a nice personal site about kd with a bunch of good pictures (not thumbnails). Sign the Dreambook! Jazzer's kd site... cool bio and gallery link. I've linked directly to the kd content, but check out the rest of her site too! This Warner site gives a list of all the radio stations that *should* be playing kd.. if they're not, let them know! THE Canadian archive source for kdlang info: tons of articles and reviews. Do a search from here. Thursday Oct 19, 1995, 40 minutes of kd on Morning Becomes Eclectic! interview and music! happy happy happy! ... and I quote: "I'm like a squirrel; I like to hide my gems." LOL! Go to this page to sign up for the kdlang mailing list... the up-to-the-minute langster news party!